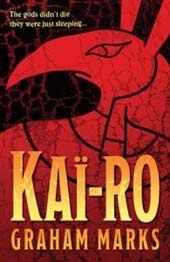 I've had Kai-Ro on my shelves for years now, probably about 6/7 if I'm remembering this right. Quite frankly, that is embarrassing, so I decided to bite the bullet and give it a read. I didn't really have much in the way of expectations, as it was a book that I got as a stocking filler, although the synopsis seemed interesting enough. Kai-Ro follows a young boy named Stretch Wilson, who has just lost his father to slave traders and must now fend for himself in a post-apocalyptic desert wasteland. Whilst scavenging for valuable scraps of technology from before the apocalypse, he falls through the rubbish and finds a door, beyond which he can see a tantalising glimpse of what just might be gold. What he doesn't know is that by exploring the space beyond that door, he will be involving himself in an epic battle between two resurrected gods. In theory, this book has a lot that interests me. There's a focus on the Ancient Egyptian religion and some of its history, which appealed to the nostalgic part of me that remembers wanting to be an archaeologist because of Egyptian history. There's an interesting angle in looking at the classic good vs evil story by making it a conflict based on strength of faith; the idea that in order to triumph, the heroes need to create enough faith in their deity that it can combat the faith generated by the opposition is really quite fascinating. And the post-apocalyptic setting is written with some really interesting details that makes me want to explore it more. I just wish that there was more of it. The base of what could be a really fantastic epic, but there's not enough space for it. The book spends all of its time building up to the final confrontation between these gods. And then it just sort of ends. None of the subplots get resolved, because hey, the main fight is over. Why would you want to see if Stretch finds his dad again? Why would we want to know what persuaded Ty, the most initially reluctant of his companions, to join his mad escapade? Why would we want to give Stretch any more time to actually react to the casualties of this final conflict than the measly paragraph before the story screeches to a halt? It just frustrates me so much, because I liked this, but it just rushed at so many key points. This really should have been longer, to give the story room to grow naturally. Next review: Nation by Terry Pratchett.